Enterprise Resource Planning is one of the most sought after tools when running a business that has inventory, employees, vendors, and customers that all need to be tracked and organized. It is the top priority of any successful business to closely control these areas to reduce the loss while increasing the profits. This blog will examine all things related to managing your business and how an ERP fits into those needs. One of the first tasks you will complete after logging into your JBitPro account is, to create an employee record for yourself, and for any of your other employees/users. It is necessary to have an employee record so that you can create - sales orders, purchase orders, receive inventory, and complete other tasks in the ERP system. NOTE: One user can have multiple employee records tied to it. Though this is currently allowed, it isn’t recommended. Each user that will be using the system should have an Employee record if he/she will be completing tasks that are tied to an employee record. Such as Sales Orders, Receiving, and Purchasing. After using “Add Self”, you should edit your employee record to include information about yourself. Use the “Edit” button to edit your employee record. NOTE: There will be the ability to store secrete employee information. You will be able to securely store SSNO, Drivers License, and other personal information. It will be encrypted and only accessible from your account login. Not even JBitPro staff will have the ability to view this secret information. If you want to use Badges for your employees, you will also be able to manage them from your account. You can view the employee details or edit them by clicking the appropriate button in the employee table. 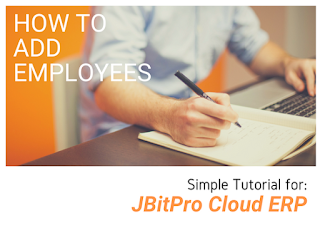 Adding Employees to your JBitPro account is simple, and is important. It is required if you are going to be using JBitPro to create Sales Orders and for Purchasing inventory, or to receive inventory. These tasks require a level of accountability and need to be tied to a user/employee. If you haven’t registered yet for your free JBitPro Beta account, what are you waiting for! Click here to get started now! Self promotion not allowed. Comments with links to ERP systems other than JBitPro.com will be deleted. Please respect others, and share your thoughts with the author. Criticism and critiques are welcome! You're in the market for an ERP system. You have narrowed your search down to 3 major brands, SAP, Oracle Netsuite, and SAGE. You are reviewing the costs involved, and to this point are still unsure of which one to pick. Each of those above have the same recurring problem that makes it very hard to decide which platform to go with. They all have the same core benefits - the promise of making more money by managing your P&L closely, and automating the important tasks that keep your business alive. But when you balance the cost vs the increased revenue it will bring, by reducing your losses and increasing your efficiency, you find that the increased revenue will cover the new ERP system. We know the difficulties associated with finding the right ERP system, and how expensive it can be to purchase the right tool. Too many ERP vendors are taking advantage of businesses by charging outrageous prices. Read the eBook for information you need to make the right choice. What is the Best Way to Manage Inventory?